Thank you very much for the kind words, Captain. I am sorry I didn't notice your post until just after I made mine, else I would have responded to you first, before posting my daily. Keep at it, brother! And I wish you every success! Had three practice drives before lunch, with noticeable improvement on each one. First drive, I was doing very well with my up-shifts, but couldn’t buy a gear going down. Second drive, I was better, more relaxed and made more good down-shifts than bad, and when I did make mistakes, I recovered quickly and without becoming ‘flustered’. Third drive, the instructor said he didn’t know why I was failing. Test was sometime after lunch. Test failed for ignorance. I was under the impression that we had to take all turns in 5th gear or lower. I was going quite slow enough in sixth to take the turn safely, but when I tried to get into (what I thought was required) 5th for the turn, I wound up having to stop and reset to third with traffic behind me; Auto-fail for “impeding traffic”. I continued the course as if I was still being tested, and when we got back the examiner told me: 1. There is no DOT requirement to be in any gear for a turn, only that turns must be smooth and safe, and 2. Had I simply left it in 6th, I would have accrued a single point over the entire course - I had a left turn followed by a lane change, for which I failed to cancel my turn signal in between (“improper use of signal”). I am looking very much forward to tomorrow’s attempt. The joke is no longer funny. I have never had to work so hard for something in my life. I am supposed to be the one who picks it up instantly and is soon helping the slower students along. I got a lot of smooth shifts in, as well as a few sloppy ones, but one event of “coasting”, a failure to signal a left turn and a couple other errors I am too frustrated to remember mean I get to come back tomorrow for attempt number four. On the fourth right-hand turn of the trip, and hardly 2 or three miles from the start, I couldn’t get into 5th gear, so rather than fail automatically for “coasting out of gear” I stopped and re-started in third. Had there not been a car behind me, I would have been fine, however the presence of the vehicle behind me made my stop constitute “impeding traffic”, an automatic fail. Examiner said I was doing well with previous up and down-shifts, but this instance, I failed to give a big enough “rev” during my shift to 5th, and had I done so, there would have been no need to reset. So, I went to the practice truck and did about half an hour of clutch-rev-clutch drills. Try again tomorrow, with perhaps a practice drive in the morning. I'll get it. It's just unusual for me to be in the group that takes a few extra attempts to "get it". This is a mechanical skill, and the more I do it, the better I get. The citizens of Iowa and the other 47 contiguous states have been spared one more day of the terror that is me with eighteen wheels on the public roadways. 1. On a “bad day” (I was very nervous) I am one point away from passing, so a little bit of “chillaxation” is all I need to pass. 2. This place is absolutely NOT a “CDL/diploma mill”. 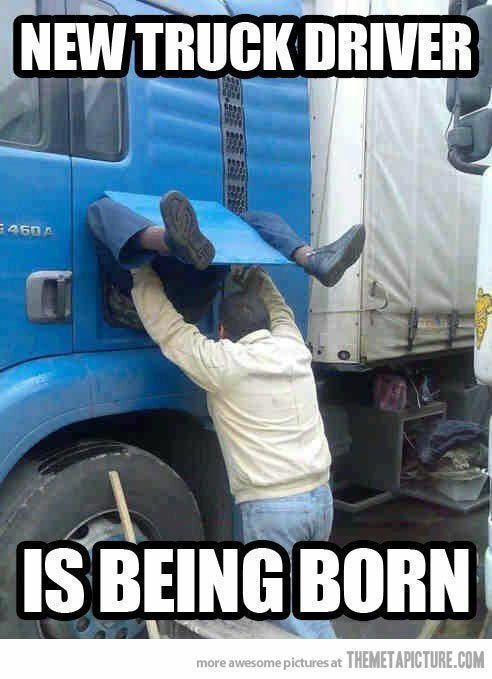 You don’t get a CDL until YOU EARN IT BY DEMONSTRATING THE EXPECTED LEVEL OF PROFICIENCY AT THE REQUIRED SKILLS. Tomorrow, I am very likely to pass, as I won’t be nearly so nervous. I am still expending a larger chunk of mental energy than I would like on the transmission, but that chunk is steadily shrinking and will become second nature soon. Day Twenty - Home Stretch, Baby! I reported at 0800 today. My backing practice session was scheduled for 0845, and my backing test was scheduled for 1300. I picked up a trainer and a fellow student for a road drive after my backing session. We returned from our drive with a few minutes to spare before lunch (hot dogs and chips) was served. I was a bit sloppy today, picking up 9 points of a maximum 12 to still pass. It was good enough for the DOT; so it’s good enough for me. Road test tomorrow, class meets at 0615. While I know that certain things during the road test will incur points (another lowest-score-wins test) such as “coasting” - moving more than a very few seconds with the clutch disengaged or “excessive grinding of transmission gears; and some things are automatic failures (violation of any law, striking a curb, usually on a right turn), I can’t really peg down how well or poorly I anticipate performing. I will just drive, following my examiner’s instructions, and take what I’m given for a score. If needed, I’ll just practice more, rectify my mistakes, and try again until I pass. I was insomniac last night for worrying about today’s test, but managed about an hour and a half of sleep. I am not twenty anymore! I started the day with backing exercises followed by 2 road trips, and tested at 1100. I took my time. I took a deep breath after each subsection. I passed with a score of 42 of about 47 possible (higher is better in this part of the exam). I moved on to the backing exam after lunch of mammoth submarine sandwich. I got myself into an awkward position outside the lane, approaching an entrance corner cone. Instead of striking the cone and taking a 3-point hit, I pulled forward to cause a ‘reset’ (return to starting position) for one point. Having noted landmarks while in my starting position, my reset was perfect. I proceeded to perform a beautiful 90° alley dock maneuver. The truck was straight, reasonably centered (maybe 8 or ten inches left), parallel to the sides, and the DOT bumper neatly centered in the box. Nailed it! Next was the straight backing. I was supposed to back straight through two parallel rows of cones until the front bumper was beyond the rearmost cones. I stopped when the bumper cleared the foremost cones. I will do it correctly tomorrow. Then will be the road test. I improve or learn something every time I get behind the wheel. So, from here on out, it’s practice a bit, test, practice, test, etc., until the DOT examiner says I am good enough to be turned loose on the general public. I am up-shifting now in a manner that no longer involves other occupants of my vehicle picking their teeth from the windshield, and making strings of smooth down-shifts. I am no longer losing track of what gear I am in, and recovering from errors without getting flustered. I am now, and will continue gaining skill and improving my timing and coordination. I still expend a lot of mental effort on managing the transmission, but it is getting easier all the time. I can’t make an accurate prediction when I will receive the DOT’s blessing, but am certain it won’t be too far off. Hit all points until step 6. When fanning the brakes to expend air pressure until the safety valves pop, and if only one of them pops, or I am unsure whether it popped, just KEEP PUMPING THE BRAKE PEDAL - OVERCOME THE NATURAL DESIRE TO TOUCH THE VALVE IN ANY WAY. Lesson learned: it is ok for the truck to fail the test; it is not ok for the driver to fail the test. I feel like Ernie Els at the Masters’ Tournament. I believe I’ve made all the stupid mistakes possible on this part of the test. I KNOW THIS STUFF!! I need only to stop shooting myself in the foot! Success shall be mine tomorrow. Day Seventeen - White Hat? The modus operandi of test week is as follows: There are four “carousels” (backing practice stations marked on the practice range, carousel 1 being the primary testing station). Students of the third week class are divided into groups of 3 or 4 and begin the day either in a truck for road practice or at a carousel for backing practice. Road trucks allow for one student to drive the outbound leg, and second student drives the return leg of the test route. This takes about the same time as two students doing their backing exercises at a carousel. So a returning truck will stop at a carousel to exchange ‘spent’ students. Lather, rinse, repeat. After lunch, second-week students (who have been in the classroom all morning) take to the range and third-week students return to the classroom for a rehash of backing exercises with liberal Q&A followed by remedial training assignments (based on need and trainer availability) for later in the evening and are then released for the afternoon. On testing days, carousels and trucks are allotted for testing purposes, while the remaining students rotate through the practice stations. Students are picked from wherever they are in their practice session to test in turn. Passing students move on to the next test station, students that fail return to the practice rotations. Examiner: No, not yet. Let me get in on the other side. Examiner: (after I return his computer and a couple more minutes of …computing) You will be expected to demonstrate inspection procedures … (continues his spiel) … Do you understand? As I continue my inspection and descriptions, I feel the knot in my stomach fading. I quickly gain confidence, and rattle off checklist items apace. I breeze through the parking brake tug test flawlessly. I talk through the service brake test missing only the ABS light remaining ‘off’. Now, it’s time for the air brake test. Six steps which must be performed flawlessly for me to pass (previously mentioned missed items are a point apiece toward a cumulative score I was well within). Step 1, BOOM! Step 2, BOOM! Step 5, BOOM! Step 6, BOOM! Me: This completes my test of the air brake system. Examiner: I’m sorry. You left out steps 3 and 4. You have failed the air brake test. Me: (after a brief mental recap and awareness of my errors) DOH! Me: (silently to myself) I said it 3 times already and miss it on the one time it mattered! He went over the few other items I overlooked, and rather than be saddened or disheartened, I was very relieved. The self-imposed stress of trying to earn a white hat was gone, and I knew I would get an extra day to practice my driving and backing skills. Tomorrow, I will nail it. I went back and plugged myself back into the practice rotations. Back at the dorms, I learned we had 2 white hats earned today. Congratulations! Had a great time on my first road trip today; I still lack polish, but I feel I am ready to test and will do well, especially if I go in 'fresh'. Backing practice went well enough. I need simply to think, but not over-think, and just do it. I shall pass this, too. Second road trip today I wanted to “show off” my improvement to an instructor I had previously driven with. LOL! I got sloppy and was uncoordinated. I believe I was simply tired from standing on the tarmac and the earlier practice, because I had it all straight in my head. I am confident that going in tomorrow, I will be fresh and ready to do well. I will re-write my PTIs from start to finish once more, just for fun, hopefully get some sleep tonight, get up tomorrow and do my best, hope for the best, and cope with the rest. I am ready. Crunch time means road time for me, with a bit of backing just for fun, and pre-trip to occupy the waiting between. … or so I thought when I wrote that last night! For today’s first road driving time, I was a nervous wreck. My confidence shot for road driving, but still high for backing, I asked the range instructor about surrendering my range time for another time on the road. He recommended I just go through their rotation as programmed, which I did, and am glad for it. I got served a nice fat slice of humble pie on the range. I made mistakes, and learned from them. Had I went on the road instead, I would have lost this valuable learning opportunity. My second time on the road I feel I am back where I was on day before yesterday. Where I judged myself previously “very poor, but improving steadily and continuously”; I now upgrade myself to “poor, but improving”. They assigned remedial lessons for the worst performers on the range, having no instructors available for remedial road training. I was not among those assigned remedial range training. There’s also the possibility that I am indeed my own worst critic, and actually doing better than I think. I talked to an ‘upper echelon’ trainer to as his email address to inform him of this diary to append to my student survey, and he asked me what my weak spots were. I told him, and he taught me a couple of exercises (clutch-rev-clutch to get the feel for 400rpm for downshifting, and dry-shifting to improve my speed and coordination for the task) to perform in the tractor we use for PTI practice. I did these until my leg hurt, and then did an in-cab and air brake test, then more exercises, another in-cab, and then a third round of exercises. I predict significant improvement for tomorrow, and looking forward to finding out just how much better I will do. Since only 36 hours until I test, I now give myself about even odds at a white hat, and near certainty of completion by Friday. While waiting my turn on the range, I was given a mock PTI form “C”. I missed several points, but reviewed them and I am very confident that I will have PTI down by test day. This is our last day of classroom/didactic training. Today we learned about the FMCSA BASICs, reviewed PTI with a fill-in-the-blank of the complete test, and reviewed backing. Lunch was chicken, potato salad, and a dinner roll. We were released after lunch. I have tomorrow and Tuesday to master my shifting, and will begin my test on Wednesday. I will get as much time on the road as I can, and attend one-on-one if available. Each student has his own challenges, but I believe that all of us will pass with proper application of effort. This week we will begin at 0615 every day. One tests each station in turn, and must pass each before moving on to the next. First is pre-trip inspection, then backing, then the road test. Roomie passed his road test today! WOOT!! I am proud of him. He worked hard for it. Bravo zulu. The two that were ejected from class yesterday returned today. I guess they have been given a good scare, and likely will not be disrupting class again. The class was divided into two groups, one for the morning session, and one for the afternoon. I was with the morning group. We started at 0615, rotated between road, range, and practice pre-trips until lunch, and were set free for the afternoon. Lunch was a hotdog and choice of chips, and we were free for the afternoon. I am writing over and over my spiel for the pre-trip inspections, as well as rehearsing them aloud. I am sure I will have them down pat by test day. I had an ‘off’ day on the road this morning. I didn’t sleep well last night, and just couldn’t seem to get my head on straight. I did get some good feedback from my instructor, though, and learned that to prevent “dumping the clutch” I should up-shift between 1200-1400 rpm, and that I should downshift around 1000 rpm. For some reason, I had lots of problems getting into 7th gear. I would either get ninth instead or shove it against the divider between 7 and 9. I’ll get better, I am sure. Recovery when I lose track of what gear I am in: Determine what gear I SHOULD be in, and put it there. Backing up, I did well. I am not nearly perfect, but certainly passing. We are down to about 27, losing two punks today disrupting class with their cell phones during a video about not using your cell phone while driving. I hate to see anyone lose their job, but these two clearly did not want to be there, and didn’t have the courtesy to turn off their phones or just leave of their own volition. They got what they wanted and deserved. Of the other six missing since last I counted, one left for a death in his family, the rest I have no idea why they left. Today was a milestone: Smith System test. I was among 8 that aced it with full marks, and right proud of the achievement. Most others passed it. The few that failed will re-test tomorrow at 0500. Lunch was hamburgers and chips. This time they served two meat patties apiece, and that made for a more satisfying meal than last time we had burgers. This afternoon was backing practice; I took two turns at the wheel. First turn, I did the blind-side offset and the 90° alley dock. Second turn I did just the 90. I am well pleased - I completed all maneuvers with very limited coaching. When not driving, we practiced pre-trip inspections, focusing mostly on the in-cab portions and air brake test. The air brake test is critical. On other portions, one may miss up to a certain number of items and still pass, but a single missed item on the air brake test constitutes failure. We are divided into two groups for tomorrow. My group convenes at 0615, so I shall take an early bedtime tonight. Thanks, Cwc, I agree, but my instructor repeatedly mentioned it, so I must take the instruction and comply. I presume myself to be in error, and learning how things look from my new perspective much higher off the pavement than I am accustomed to. Morning Session was HoS, Log Sheets, student course evaluation, Smith System, and pre-trip quiz games. Lunch was mammoth sub sandwiches & choice of chips. 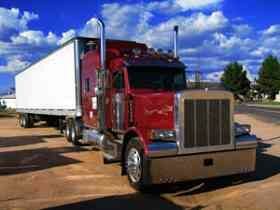 They put me on the road again today with a fellow student who is returning to trucking after a hiatus of several years. He makes it look so easy!! I continue to improve my shifting every time I get behind the wheel. I can now up-shift pretty reliably (90% of the time) and am learning which gears are appropriate for what speed. Down-shifting is still the biggest challenge for me. I have not yet learned to plan my stop to be in third gear when I arrive at the place I want to stop or to be in 5th for a turn. It is often difficult to match the revolutions and engage the desired gear, but sometimes I can string 3 or 4 sweet shifts in a row. As well, if I leave it in the same gear (except tenth) for some time, I will forget what gear I’m in, and be lost until reminded, and it takes me a long time to get it right in my head as to what to do. I must also work on overcoming my tendency to ride the white line on the right-hand shoulder. I guess it’s a better bad habit to have than being too close to the centerline! My instructor said I was actually ahead of the curve for someone with no previous experience. I was quite surprised to hear that. I judge my own performance as “very poor, but improving steadily and continuously”. To hear that someone as uncoordinated as me is ahead of the average in this coordination-dependent skill is hard to get my head around, but uplifting to know. I remember learning to make a C chord on my guitar; I had to use my right hand to place the fingers of my left hand in the correct positions on the strings, but I worked at it until it became second nature and will do likewise with this. I SHALL TAME THIS BEAST THAT IS THE EATON-FULLER TEN-SPEED TRANSMISSION! I still give myself about an 80% chance at a white hat, and 0% chance of leaving this place without a CDL. Morning Session was backing review, Smith System, and pre-trip quiz games. Lunch was nachos, same as last week. Afternoon session I was back on the road. We were 2 students with one instructor. I am very poor with shifting, but my fellow student was much better than me, so I watched her closely when it was her turn to drive. We took 1-hour turns driving for four hours, each netting two hours of driving time. I improved significantly, but still have a long way to go. If I were to test tomorrow morning, I would pass all but the road test. Considering my rate of improvement, I give myself 85%-90% chance of earning a white hat for passing everything on my first attempt, 95% chance of passing with one re-test, and 100% chance of passing by the end of test week. 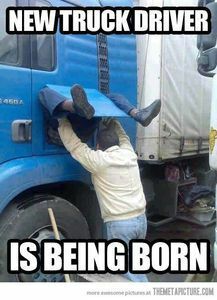 I’ll not leave here without my CDL.